Meanwhile, in small bowl, mix together lime peel, lime juice, oil, honey, cumin, ginger and salt. Set aside. Gently toss pasta and remaining ingredients in large bowl. Pour dressing over salad; toss gently to coat. Cover and refrigerate at least 1 hour to blend flavors. “Refreshing, yummy and light tasting.” Pat R.
Large, thin and crisp wafer-like crackers are low in calories and a great accompaniment to this flavorful salad. Look for them near the deli cheese case, gourmet foods aisle or snacks section of your supermarket. 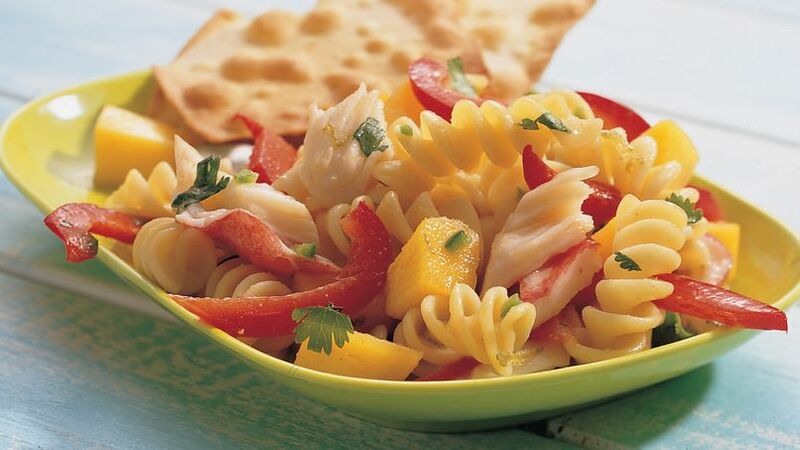 Add a citrus twist to crabmeat pasta salad with lime that’s perfect for a dinner.